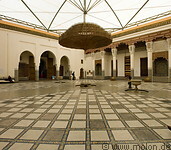 The Marrakech museum lies near the Ali ben Youssef medersa and is housed in a beautifully restored 19th century riad. The interior of the museum consists of rooms with beautiful decorations: mosaics with Islamic patterns, stucco decorations, carved wooden doors and furniture. The riad was restored by a wealthy Moroccan, Omar Benjelloun.